Sir John Valentine Carden, the tank designer, built Carwarden House near Camberley in Surrey, England, in 1932, soon after he inherited the title. He knew he should have spelled it Cawarden without the ‘r’ but apparently the mistake was made when the name board was painted! It is now a school for children with learning difficulties. Out of the blue I received an invitation from the headmaster, Jarlath O’Brien, to attend the jubilee of the 1964 opening. He asked for the addresses of the current baronet and of Isabel Carden of New York, grand-daughter of Sir John. On September 12th, Isobel, my brother Michael and I attended the Jubilee. 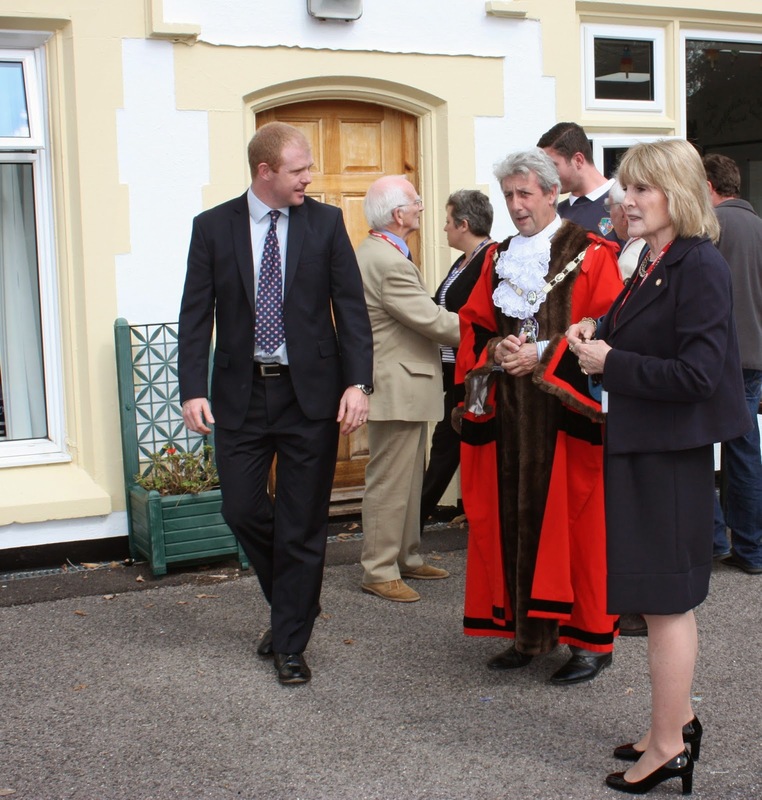 The photograph shows Jarlath on the left, Isabel on the right (with the mayor), and centre, by the door, Michael. The window on the left is a replacement for the one pictured in Carden of Templemore. The original was a single sheet of glass which could be lowered into the ground so that people could step outside from the sitting-room, typical of Sir John’s imaginative engineering. We were all tremendously impressed by the school and the way in which it enabled so many disadvantaged children to enjoy life and participate in society, finding work in supermarkets, hairdressers, bakeries, etc. Many classrooms have been added, but much of Sir John’s original house remains unaltered. Jarlath and others were very pleased to learn more from us about Sir John and the building. “That explains why there is a story of a tank being buried somewhere in the grounds,” he said. Afterwards Isabel, Michael and I tried to find Sir John’s tomb (where the 7th baronet is also buried) in a nearby cemetery, without success. (A more comprehensive record will appear in the next edition of Carden of Templemore). Thank you very much for this post and to Michael your brother, to you and to Isabel for travelling such a long way to join is in our Golden Jubilee celebrations. We were delighted to learn from you all about the life of the house before it morphed into its current guise as a special school. It added the required sense of history and personal touch to what was a memorable day. Our door is always open to the Cardens! Drop by any time.